2018 Marks EcoMall's 24rd Year on the Internet! Shopping has a Enormous Impact on the Environment! Founded in 1994 by a diverse team of professionals committed to protecting the environment, the EcoMall is dedicated to educating and helping consumers achieve power over their online spending dollars. Passionately committed to integrating environmental awareness into daily decision-making at all levels, personal, professional and public, the EcoMall seeks to help consumers exercise their pocketbooks to contribute to a healthier, more sustainable and earth-friendly future. Since its launch 24 years ago, the EcoMall has provided educational articles, a comprehensive selection of environmental companies, products and services, exclusive interviews with celebrities and more. 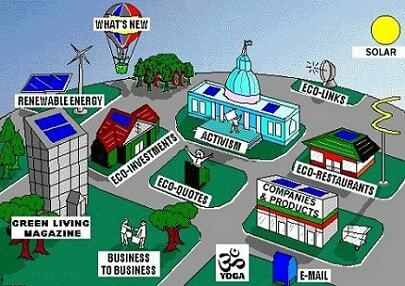 The EcoMall offers a voice to America's sustainable business industry, featuring over 200 retailers and wholesalers in over 70 shopping categories, links to government education, non-profit groups, environmental news, activism alerts, as well as the EcoMall's popular "Green Living Magazine". Conscious consumers can find the natural and organic products they desire at the EcoMall. "Green" has become "mainstream". The National Marketing Institute estimates that consumers with environmental concerns represent more than $230 billion in spending power. Today green living is more important than ever. Help reduce your eco footprint on our planet. We all have an impact on the Earth - an ecological footprint left behind by our activities and consumption habits. Shopping with the planet in mind can make a big difference in many ways. Collectively, we can reward environmentally responsible practices, discourage waste, help close the recycling loop and reduce the amount of toxic materials entering our ecosystems. Buying products and services that don't harm the environment is one of the most powerful choices a consumer can make. Organic, natural products promote the health and wellness of our body and world. Buying online has been demonstrated to have a smaller environmental footprint. We are proud to be part of the effort to keep our environment safer and greener. Thank you for supporting a kinder, healthier, and more sustainable world.